Who We Are Universal Nutrition has been providing cutting edge and staple nutritional supplements to bodybuilders and hard training athletes the world over since 1977. As time passes, certain ideals never go out of style. Honesty. Integrity. Respect. These are the values we uphold and are the bedrock upon which we built our business. 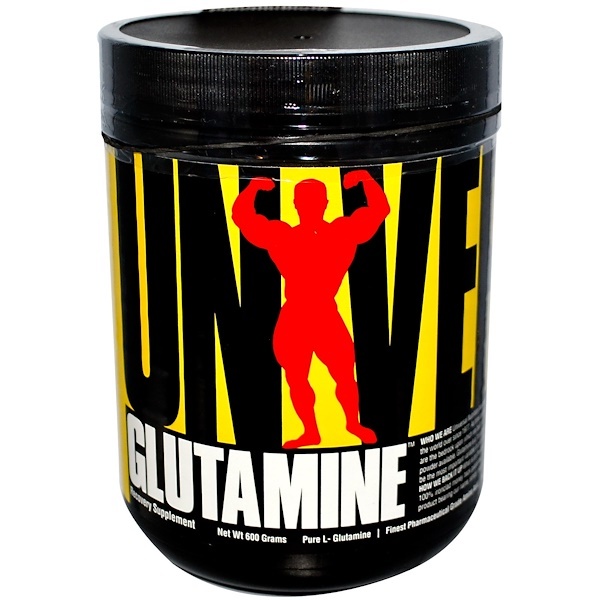 What It Is Glutamine Powder from Universal Nutrition provides the purest L-glutamine powder available. Glutamine is "conditionally" essential pro-anabolic amino acid and is the most abundant amino acid in muscle. Glutamine may be the most important variable in promoting optimum protein synthesis, while helping block cortisol to prevent protein breakdown in muscle. How We Back it Up What is on the label is in the bottle and what is in the bottle will help you reach your goals. There are many supplement companies out there. Who do you trust? Most of the companies are marketing-only companies who rely on "contract manufacturers" to make their products. At Universal Nutrition, we are a GMP manufacturer. We don't just market our products, we make them too. We also stand behind every product we make with the best guarantee in the industry. This is our way of standing behind every product we sell. So whether you buy an Animal or Universal product, you can have all the confidence you need to make the right choices. Mix 1-2 rounded teaspoonfuls in 8-12 oz of your beverage of your choice. For optimal results, try using it in your favorite protein shake or meal replacement powder. 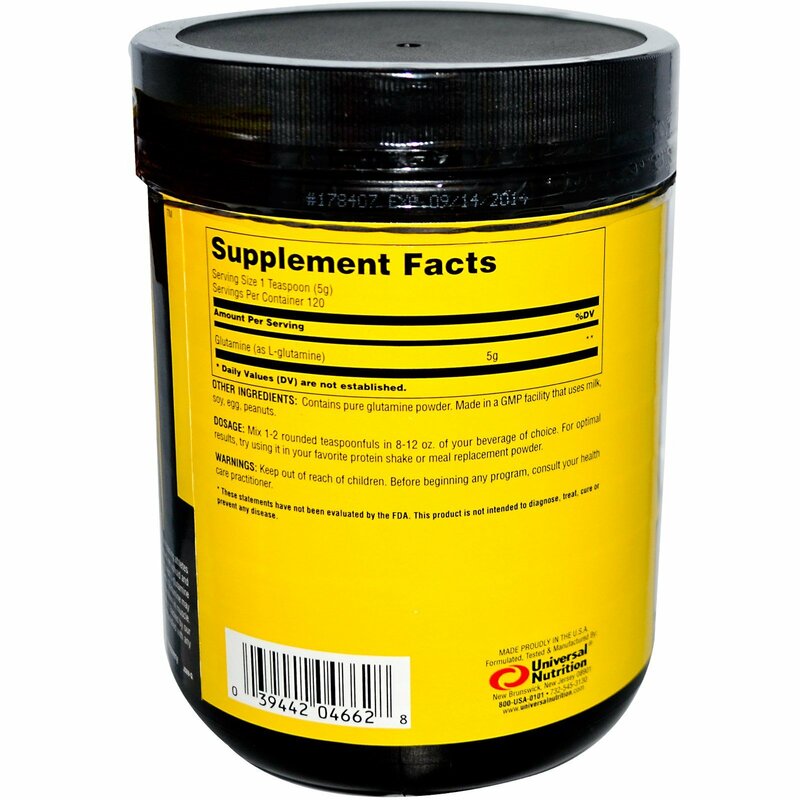 Contains pure glutamine powder. Made in a GMP facility that uses milk, soy, egg, peanuts. This product is not for use by any individual under the age of 18. Please consult with a physician before using this product. Do not take this product if you have or are at a risk for any medical condition or disease, including but not limited to diabetes, asthma, depression, recurrent headaches, glaucoma, difficulty urinating, prostate enlargement, seizure disorder, high blood pressure, high cholesterol, arthritis, heart disease, stroke, or are suffering from any inflammatory diseases. Be sure to talk to your doctor before using this product if you are using any prescription drug, over-the-counter medication, or dietary supplement. Not for use by children, geriatric patients, pregnant or nursing women. Immediately discontinue use and consult your healthcare professional if dizziness, sleeplessness, tremors, nervousness, agitation, headache, heart palpitations, or any other side effects occur. Discontinue use two weeks prior to surgery. The use of this product may be banned by some athletic associations. Athletes should consult with their sanctioning authority before use. This product contains a chemical known to the State of California to cause birth defects or other reproductive harm. Exercise good judgment and keep this out of reach of children. Store this product in a cool, dry place, away from heat, moisture and sunlight. Do not exceed recommended dose.